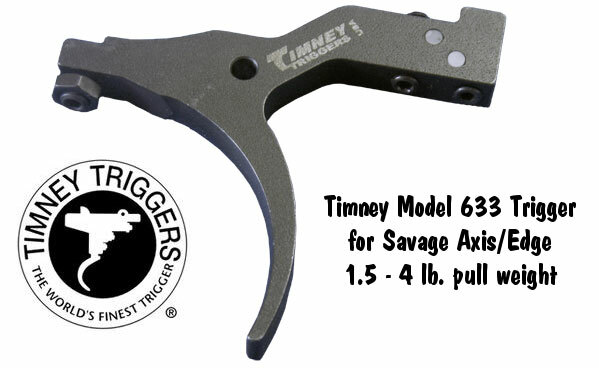 Timney Triggers has introduced a new drop-in trigger for the Savage Axis/Edge line of rifles. The new Timney Axis/Edge trigger (Model 633) is CNC machined from solid steel and then case-hardened. The Model 633 Axis/Edge trigger fully adjustable for pull weight, sear engagement (creep) and over-travel. The trigger’s pull weight can be adjusted from 1.5 to 4 pounds, an ideal range for a hunting rifle. Midsouth Shooters Supply has the Model 633 trigger in stock now. The Timney Axis/Edge trigger retails for $104.95 for the standard blued version and is also available nickel-plated for $114.95. Each trigger is hand-assembled, calibrated, and tested before shipping. Timney offers a lifetime warranty on all of their products. Triggers are Made in the USA. Share the post "New Timney Trigger for Savage Axis/Edge Rifles"